The holy of holies described in Exodus is a portrait of New Jerusalem as the eternal holy of holies. Another picture of New Jerusalem is the breastplate worn by the high priest (Ex. 28:15-21). The breastplate is “of gold, of blue and purple and scarlet strands, and of fine twined linen” (Ex. 28:15). The gold signifies the divinity of Jesus Christ. The linen signifies His humanity with heavenliness (blue), royalty (purple), and redemption (scarlet, signifying His shed blood). All of these are seen in New Jerusalem. The breastplate had four rows of precious stones, three in each row (Ex. 28:17-20). Likewise, the foundation of New Jerusalem has twelve precious stones (Rev. 21:19-20). 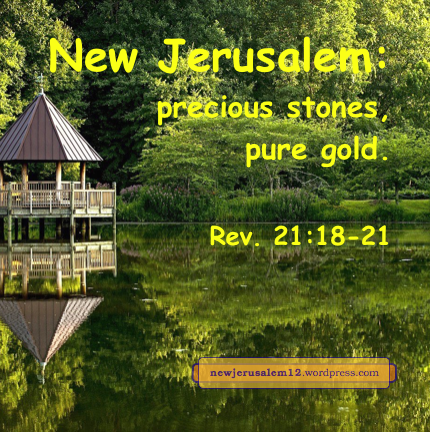 The stones were “set in gold;” similarly, gold is mentioned in the description of New Jerusalem both before and after the precious stones (Rev. 21:18, 21). Furthermore, the gates of the city, with the inscribed names, are three each on four sides of the city, matching the breastplate with three inscribed stones in each of four rows. The picture of the breastplate and the reality of New Jerusalem are all God’s people built together in the divine nature. The twelve names, plus the twelve names of the apostles on the foundations of the city, indicate that New Jerusalem includes all God’s people, and is eternal. In the Bible the number seven indicates something complete done by God in this age or past ages. Examples are victory by encircling Jericho for seven days (Hebrews 11:30) , the seven Spirits for the seven churches (Revelation 1:4), and seven churches to bear the testimony of Jesus (Rev. 1:10-12,20). In the Bible twelve indicates what is eternally perfect in quality, eternally complete in quantity, and eternally rich in composition. 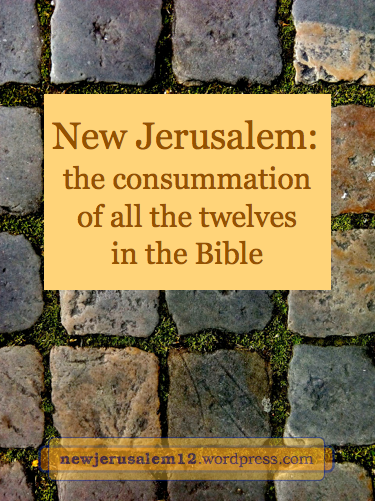 New Jerusalem is full of twelves and is the consummation of all the twelves in the Bible. New Jerusalem has twelve gates, its wall has twelve foundations, it measures twelve thousand stadia, and the tree of life produces twelve fruits. Furthermore, the measure of the wall is one hundred forty-four, which is twelve times twelve. New Jerusalem is the consummation and reality of all the twelves in the Old Testament. The obvious “twelve” are the tribes of Israel (Gen. 49:28), the sons of Jacob (Gen. 35:22). On the twelve gates of New Jerusalem are inscribed “the names of the twelve tribes of the sons of Israel” (Rev. 21:12). These names show that New Jerusalem includes God’s Old Testament people. In the Old Testament there were twelve loaves of bread on the table in the tabernacle (Lev. 24:5). Their eternal enlargement is the twelve fruits of the tree of life in New Jerusalem. In addition, there were twelve precious stones set in gold on the breastplate attached to the ephod of the robe of the high priest. Their eternal reality is the twelve precious stones and golden nature of New Jerusalem (Rev. 21:18-20). Christ Himself is eternally perfect, complete, and rich. He desires to live in us and be formed in us (Gal. 2:20, 4:29). Lord, live in me today and form Yourself more into me today to bring me onward to the reality of New Jerusalem.